The rest day saw grandmasters head for the youth center Zeka to give simuls to children. A master class for youngsters was carried out by Magnus Carlsen, Shakhriyar Mamedyarov, Sergey Karjakin, David Navara and Rauf Mamedov. A football contest, so much-looked forward to, took place during the second half of the day. It was a lineup of four teams: Two teams of chessplayers (a local and an international ones) and two teams of organizers. The Azeri team, captained by the head of the Supertournament's Organizing Committee Mahir Mamedov, was membered by Shakhriyar Mamedyarov, Anar Allahverdiyev and Nijat Abbasov. Faiq Hasanov demonstrated high performance in the field, while the goal was quite successfully kept by Lutfiyar Rustamov. In one of the semifinals the Azeri chessplayers outplayed the organizers 8-0 to make it into the final. It goes without saying that the international team’s star was Magnus Carlsen, who is as unstoppable and persistent as he is over the board. The Norwegian’s performance was tough (Sergey Shipov would say “as hard as a bone”) and, in my opinion, deserving a couple of "yellow cards". On the other hand, he was the one to score so many goals. Magnus’s team was lined up of Veselin Topalov, Denis Khismatullin, Ding Liren (it felt a bit scary observing him in the first few minutes) and Silvio Danailov, while the goal was reliably defended by Peter Heine Nielsen. Having defeated the second organizer's team in the semifinals, the international team went on to take the final as well. The home team was outplayed by a narrow margin of 2-1. The awarding ceremony left the cup in the champion’s steady hands, the fact which made him very happy indeed. Meanwhile, round six’s scoreability was no higher than usual with as many as four games ending in a draw. That day’s “office” time lasted only four hours. Having been the spotlight of the Russian mass media, the Karjakin – Carlsen battle saw the Marshall counterattack. Until Black’s move 20 the game was following in the footsteps of Vachier Lagrave – Carlsen (Paris, 2017), in which the world champion managed to quell all his opponent’s threats. The game ended in a draw by repetition on move 30. I asked Magnus to share his impressions of the game. Anish Giri, unseen in the rest day activities, has scored his first tournament victory as White over David Navara. The opening was Caro-Kann. Nijat Abbasov cited Mark Dvoretsky in that no opening should be repeated more than twice as part of the same event. The game lasted 28 moves and took less than two hours. Anish Giri, “I was unsure as to how deep David’s opening preparation was going into this game. He made moves relatively quickly, including 19…axb4. You are unlikely to play this fast if you are new to a particular setup. However, after 20. cxb4 he went into deep thinking, realizing that his preparation was not that good after all. It is, of course, not so easy to be Black and uncastled in such a sharp position without prior preparation. I usually never stop my home prep if my king is uncastled still. I evaluated the middlegame position as a gorgeous one for me in all aspects. However, I need to check with my computer as to how justified my claims are. Here is Anish Giri giving us a lesson on chess psychology! Shakhriyar Mamedyarov stood his ground as Black in the Queen’s Gambit against Ding Liren, his “Berlin offender”. The Azeri grandmaster admitted being in book up to White’s move 14, at which point the Chinese caught him off guard with 14. a3. Black was in a full-on defensive mode until the trade of queens, at which moment Shakhriyar came up with an interesting way of simplifying via a central pawn break. This is when the game became completely equal, and a draw was agreed by repetition of moves. Teimour Radjabov and Radoslaw Wojtaszek tested each other’s knowledge in the sharpest line of Najdorf 4. Bg5. Both opponents came well prepared in the opening, referencing correspondence games related to this line during the press conference. Wild complications resulted in massive trades and a draw by repetition. The longest game was the tournament leader Veselin Topalov playing Rauf Mamedov. The Azeri grandmaster opted for the Chelyabinsk variation of the Sicilian Defense. After the game, Rauf noted that it was his first time playing Veselin Topalov as they had never faced each other even over a blitz game. “I had an extensive preparation during the rest day since I had no idea what he was going to be up to. I have always looked through his games, and it was important for me to approach this encounter as much prepared as possible. Going into the Chelyabinsk, I recalled Veselin's game in this line against Leko from the Dortmund tournament. I thought he would go all out to checkmate me. Being prepared for the game was so important to me that I even missed the European League’s semifinal football match,” added grandmaster. It was a truly combative game, in which Black needed to be on the constant alert. Topalov sacrificed an exchange in the middlegame to get strong initiative. 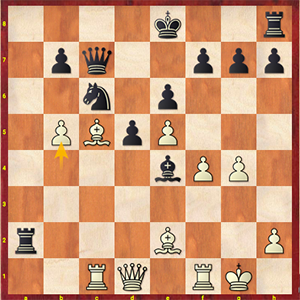 Mamedov came back with a temporary pawn sacrifice, opening up the c-file and invading the opponent’s camp with his pieces. However, Black was far from having equalized yet and had to give back the exchange. The trade of queens made his life much easier, and the game gradually ended in a draw. 1. Veselin Topalov - 4; 2-3. Magnus Carlsen, Anish Giri - on 3.5; 4-7. Ding Liren, Sergey Karjakin, Teimour Radjabov, Rauf Mamedov - on 3; 8-9. Radoslaw Wojtaszek, Shakhriyar Mamedyarov - 2.5; 10. David Navara - 2. Mamedyarov - Radjabov, Navara - Ding Liren, Mamedov - Giri, Carlsen - Topalov, Wojtaszek - Karjakin.